Not too many years ago, any guitarist worth his or her salt was strumming the power chords of Stevie Ray Vaughan, Joan Jett, Poison and Prince. Today you’re just as likely to hear the happy, melodic sound of Over the Rainbow, Ain’t She Sweet, Five Foot Two and Princess Poopooli. Welcome to the Third Coming of the Ukulele. The smallest member of the guitar family is currently enjoying a renaissance in coffee houses and concert halls around the world. One was even employed for a worship service here in Baltimore by a Christian congregation while their new pipe organ was under construction. This week, earnest newcomers and seasoned strummers alike will gather at the Creative Alliance in Highlandtown for the Charm City Ukulele Festival. The event kicks off this evening at 7:30 with a screening of the 2009 film, Mighty Uke. It continues on Saturday with a daylong series of workshops, followed by a closing concert featuring more than a dozen performers, including Baltimore’s own Victoria Vox. The ukulele was considered the instrument of choice for comics and crooners in the 1920’s. A second wave broke in the 1950’s with the emergence of Hawaiian music, only to ebb in the late 60’s as flower-child Tiny Tim faded away. 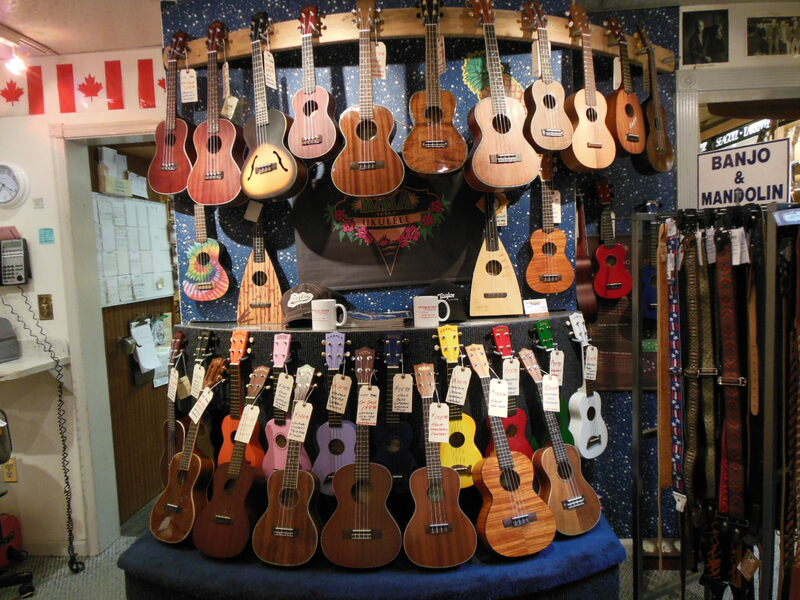 Emory Knode of the Appalachian Bluegrass Shoppe has witnessed the latest revival of the ukulele from the comfort of his handsomely stocked Catonsville store. 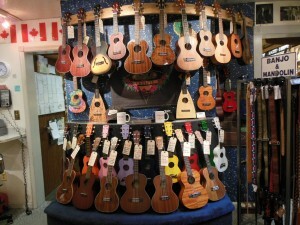 The prices for ukuleles at Appalachian Bluegrass run from about $40 for an entry level product to $1200 for a hand-crafted, concert quality instrument. Most buyers tend to gravitate toward instruments in the $100-300 range. Knode said Appalachian Bluegrass offers classes every Monday evening and hosts an unrehearsed uke jam at 1:00pm the third Saturday of the month. What advice would Knode give the first time buyer? Playing with other people has led to steady gigs for Brooklyn, New York musician “Uke” Goldberg. Goldberg told the Baltimore Post-Examiner he has been playing the ukulele for some 13 years. In that time, he has seen a growing appreciation for ukulele artists. Goldberg said his favorite players include Alan Drogin, The Naked Uke Guy, Andru Cann and Ben Lerman just to name a few. And his advice for the beginner? Wearing outlandish costumes is part of the schtick for burlesque performers Stanley Bothered and Bal’d Ligthning. The duo often pair as the baggy pants team of Hot and Bothered. 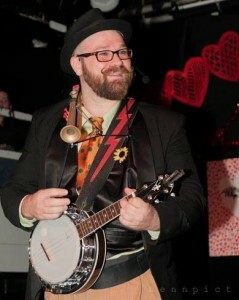 Conversely, Stanley’s on-stage instrument of choice these days is his Rally banjolele. Stanley Bothered’s advice for the beginner? Almost as cute as Victoria Vox and her mouth trumpet. The Creative Alliance presents the Charm City Ukulele Festival this week with workshops, a concert and a film. The film Mighty Uke will be screened tonight, Thursday July 24 at 7:30pm. The Creative Alliance is located at 3134 Eastern Ave, Baltimore, MD. Tickets for the screening are $12 ($9 for members) and may be purchased online. The festival continues at the Creative Alliance on Saturday, July 26 with an assortment of workshops followed by an evening concert. The cost for the workshops is $50 ($40 for members). More information may be found by visiting the Creative Alliance online. This is great. Really enjoyed Miss Vox and her Uke! Great article.